Ethiopia has been recognized as the birthplace of coffee. The Harrar region is in the Eastern Highlands of Ethiopia with an altitude between 1500-2100 meters and is one of the main growing regions. The Harrar region produces a distinctive wild varietal of Arabica coffee. This natural processed coffee has distinct berry notes. Cupping Notes: Tastes of berry, stone fruit, blackberry, and blueberry. A heavy body with bright clean acidity and complexity. 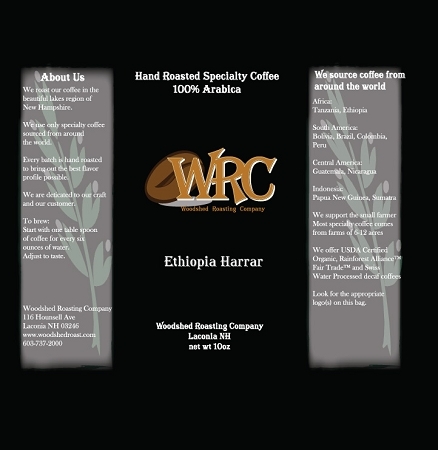 This is the first time I have ordered from Woodshed Roasters and the Ethiopia Harrar is a well balanced, complex medium roast. It was roasted the day it was shipped and the aroma on opening was worth the price of the beans. I have always been a fan of African coffees and this Ethiopian Harrar did not disappoint. Complex, smooth and not at all bitter, it is the perfect brew to start my day. First cup was a bit stronger than I prefer, probably used too much coffee. Since then this has produced a well balanced flavorful cup each brew. Generally going at 4.5 and use the AeroPress method. I’ll be buying another bag. The "medium-dark" is a slightly roastier flavor and may be abit strong for some. Therefore, I would recommend getting the Harrar "medium" roast, because I think most drinkers would positively enjoy the flavor the most. However, the "medium-dark" roast still tastes great!